After indulging and eating non-stop for the past 48 hours, I thought a bit of healthy flavors were in order. 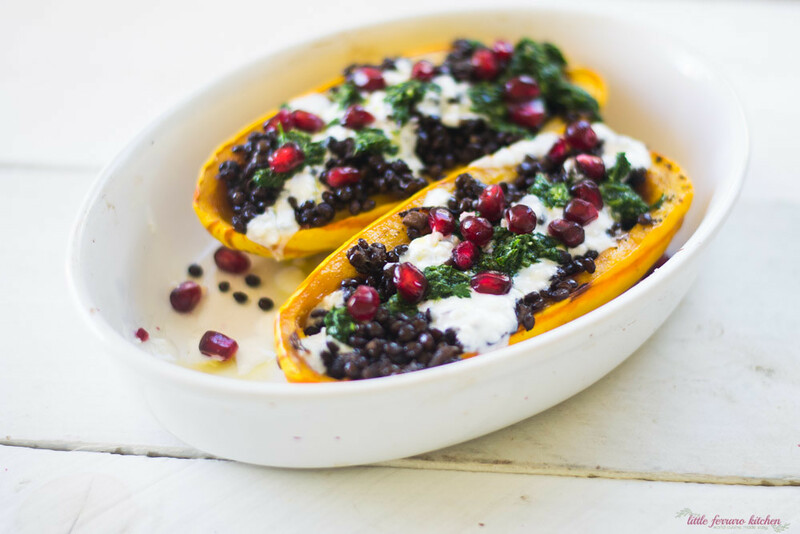 Enter this gorgeous Mediterranean flavored lentil stuffed delicata squash! You may have noticed all the sweets I’ve been sharing and we still have some pumpkin souffle left. Between Halloween and my birthday, a wholesome detox of some sorts is definitely in order! It’s no surprise that my absolute favorite squash is delicata squash! It is so tender and buttery and the skin becomes soft and palatable. I usually cut it into rings and roast it, but I thought stuffing it instead would be the perfect vessel. 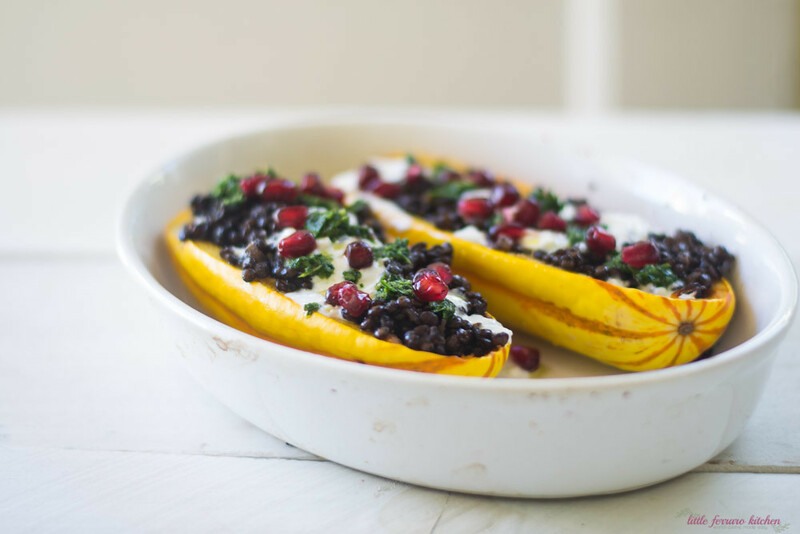 Mediterranean lentil stuffed delicata squash is a beautiful filling side dish and packed full of flavor! Black lentils are cooked with deep spices of cumin and sumac (which is found in zaatar) and topped with a spicy zhoug and creamy yogurt feta sauce. Squeeze a bit of fresh lemon juice to brighten those deep spices for a lovely contrast. I am so glad I paired up with the #SundaySupper crew again because goodness knows that I need some lightened up fair after the non-stop indulgences I’ve been having! How will you “lighten” up the Holidays? First pre-heat oven to 400 degrees F and lightly drizzle olive oil over squash. Roast in oven for 20 minutes or until tender and lightly carmelized. While squash is cooking, prepare the lentils. In a large skillet, sautee onion in olve oil until transulsent, about 6-7 minutes. Then add garlic and spices (cumin, coriander, sumac and cayenne) and cook for about 1 minute until garlic softens and spices are mixed with the oil. Next, rinse black lentils and remove any bad ones. Add lentils to skillet with 3 cups of stock. Bring to a boil and then decrease heat so that the stock is at a constant simmer. Place a lid on the skillet and allow to cook about 30-40 minutes or until all the liquid is used up and lentils are tender. Check the lentils every so often and stir them around ever 10 minutes or so. To make the yogurt and feta sauce, simply add the 2 together in a food processor (or you can do it by hand) and mix thoroughly until combined. 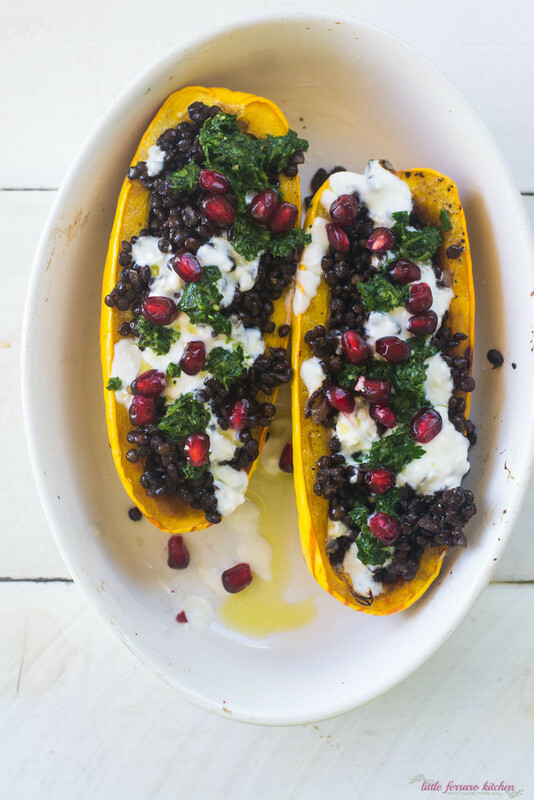 Spoon lentils into the cavity of the squash and top with spicy zhoug and drizzle of yogurt-feta sauce. Top with pomegranate seeds. I just tried this squash for the first time a couple of weeks ago and fell in love with it. They make a perfect vessel for stuffing. Your recipe looks amazing!! Love it!! I’m always looking for new ways to use lentils as I make vegetarian/vegan 5 times a week. This looks like such a great addition to my meal planning this fall and winter. Thanks! WOW – this looks amazing and uber healthy. I love the color and flavor combinations. Your filling sounds spectacular! And I’d be happy to eat his as my main dish…so lovely!!! There is a delicata squash in my kitchen that I stare at every day trying to decide what I want to make with it. Thanks for making my decision for me! Yay thanks Shaina! 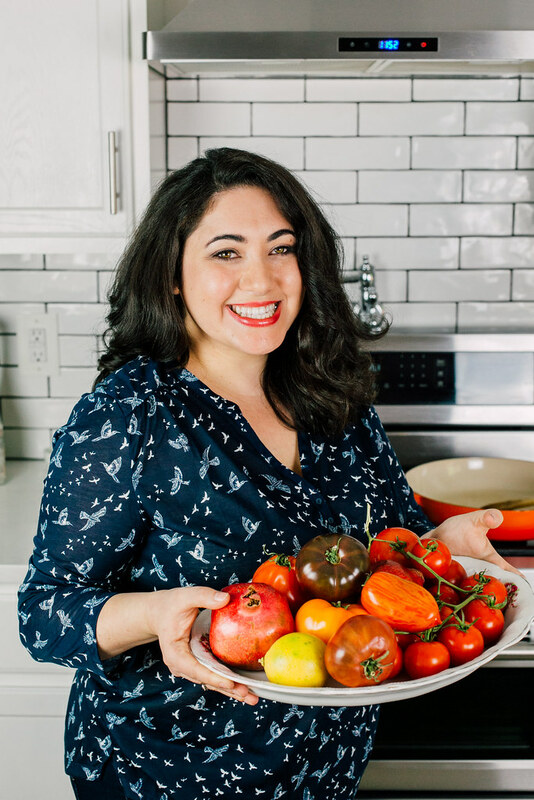 I have another recipe for delicata that we’re obsessed it…I’ll send it to you! Its my favorite squash! I am always quick to reach for butternut squash, but delicata needs a turn. Love all of the different flavors that you used. Wow! These are beautiful and look delicious! This looks absolutely delectable and amazing. I needed a new squash recipe and this is absolutely perfect. I’m always looking for great squash ideas. Love it, Samantha! Sarah recently posted..Grandma’s Mac n’ Cheese – #SundaySupper Lightens Up!